Educate the American public about the complexities and danger of cyber threats while encouraging the nation's brightest young minds to consider careers in computer science, technology, engineering, mathematics, and linguistics in support of our nation's security and economic well-being. 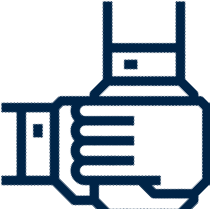 Stimulate dialogue on the broad national security, economic and public policy issues emerging from cyber technology proliferation. 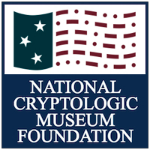 Commemorate cryptologists who "served in silence" with valor and distinction, and whose accomplishments helped to enhance and preserve our way of life. *The new facility will represent a 400% increase in square footage and nearly 9 times the current conference capacity. Design Development (50% design) and associated cost estimate and subsequent Value Engineering complete; Construction Documents (95%) completed in November 2017. 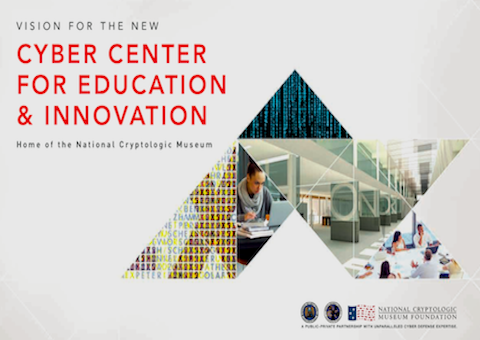 As we continue our campaign to build the new Cyber Center for Education & Innovation and home of the National Cryptologic Museum, we periodically receive questions about how the construction of the new facility may impact the current museum. For the most part, the construction of the new facility will not impact current museum operations. Once the new facility is completed, the current museum will be razed. There will be a period of one to two months where the current museum will have to shut down in order to move selected artifacts to the new facility. However, that time period has yet to be determined and is at least two years away. Click to see the December 2017 CCEI/NCM Brochure. Click to see more artist renderings of the new museum project in the Vision Gallery.